If you’re like me, there is nothing more blissful than chocolate. 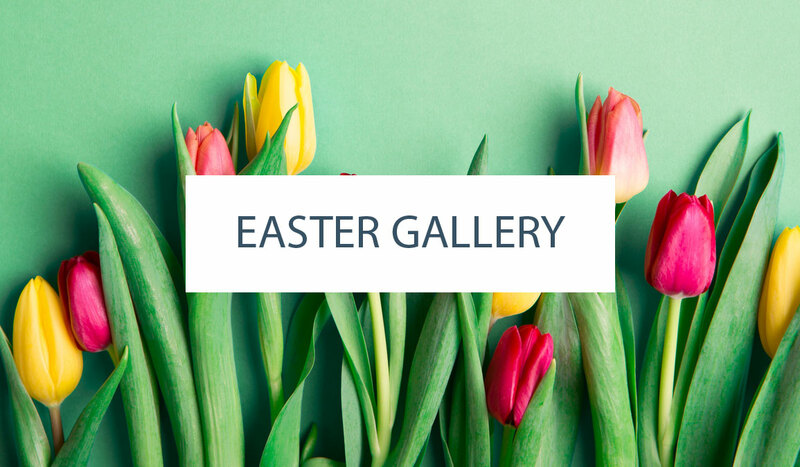 Except maybe an evening filled with chocolate truffles, girlfriends and a glass of Prosecco! 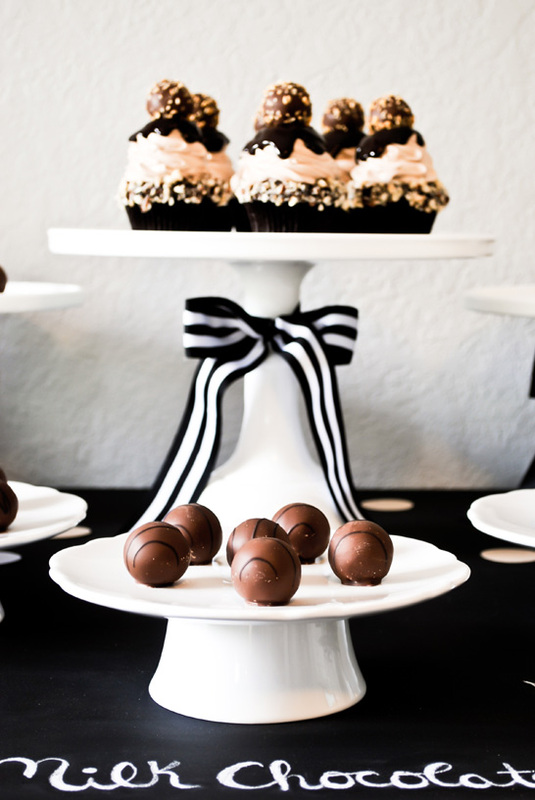 I’ve partnered up with Godiva to bring you inspiration for the ultimate girls’ get together and a new cupcake recipe. 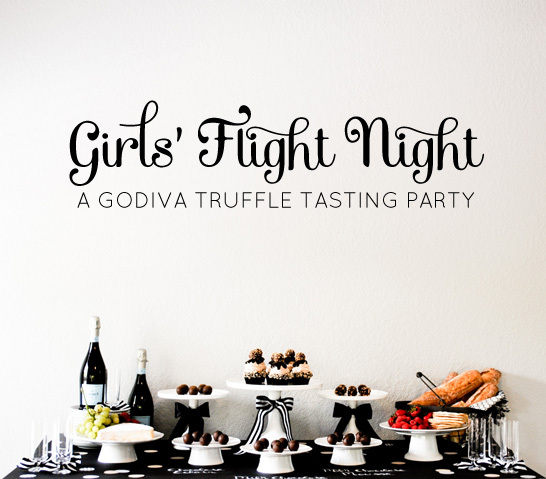 It’s a Girls’ Flight Night featuring Godiva’s new Truffle Flights. So it all starts with Godiva’s new line of Truffle Flights. 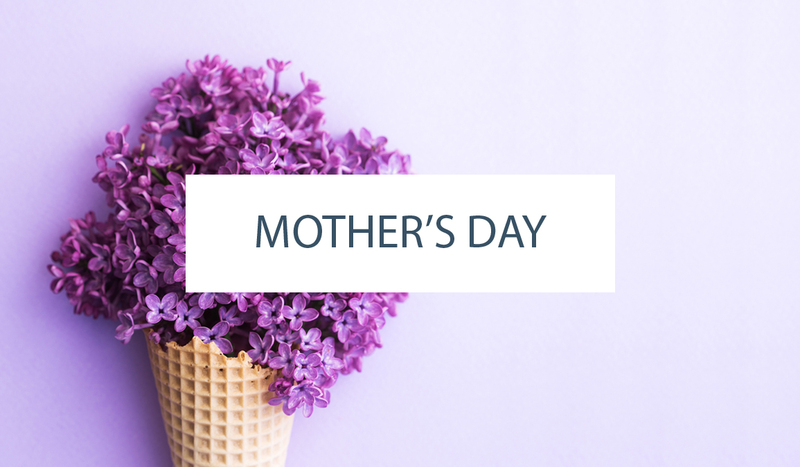 The concept is much like a flight of wine, except we’re indulging in chocolate! A box of six truffles, each one a different flavor to linger over and savor. Placed in a tasting order that builds in intensity, starting with a lighter, delicate truffle and grows bolder as you go. It’s a whole new way to experience chocolate, enjoying each subtle note, texture and aroma. It is a chocolate lover’s heaven in a sweet little box. And the perfect foundation for a fabulous girls’ night! Godiva offers six different Flights, each filled with decadent truffles thoughtfully selected to create a tasting experience. The Flights range from those tailored to nut lovers to dark chocolate lovers, mousse lovers and even cake lovers! Yes, there is a Cake Flight and I’m sure you can guess what’s next on my list of flights to try! For our Girls’ Flight Night, we enjoyed the Milk Chocolate Lovers Truffle Flight. Our milk chocolate fun began with the Chocolate Eclair Truffle. A sweet and light, creamy egg custard inside a milk chocolate shell. Paired with a glass of sparkly Prosecco to start the night off right! Then we moved on to the Milk Chocolate Mousse Truffle, which was my personal favorite. Godiva describes this truffle as “airy perfection” and that truly says it all. Blissful! Up next was the Milk Chocolate Truffle, a true classic. Only to be followed by a Butterscotch Walnut Truffle with butterscotch caramel and walnut cream with just a touch of molasses sugar. Now we’re really talking chocolate heaven. And then comes the Salted Almond Truffle. Oh my goodness! Along the way, we mixed and matched other bites with our chocolate. Pairing our truffles with strawberries, raspberries and grapes, brie and crusty baguettes. And of course, more Prosecco! The last stop in our chocolate journey was the Hazelnut Crunch Truffle. Crunchy hazelnuts and crispy bits with a creamy nut butter filling. I thought we should conclude all of this chocolate excitement with a grand finale. 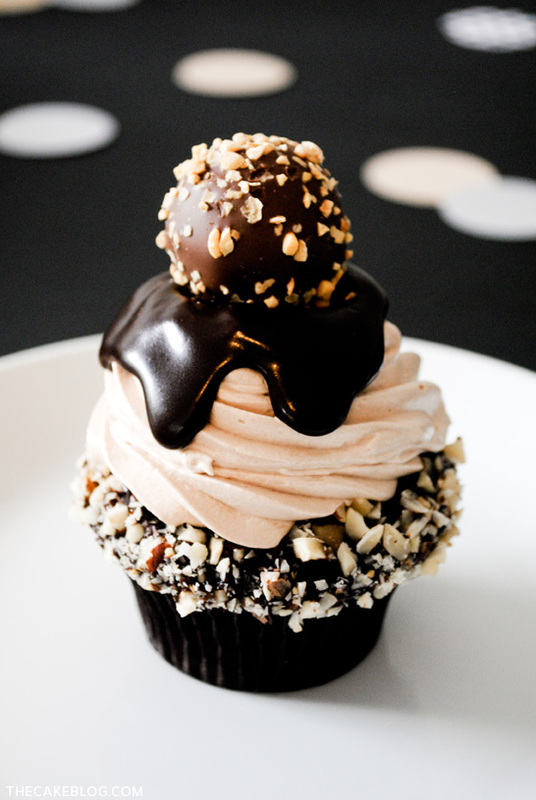 A cupcake inspired by this incredible truffle…. It sure does make for a decadent night and is a fabulous way to celebrate with your friends. 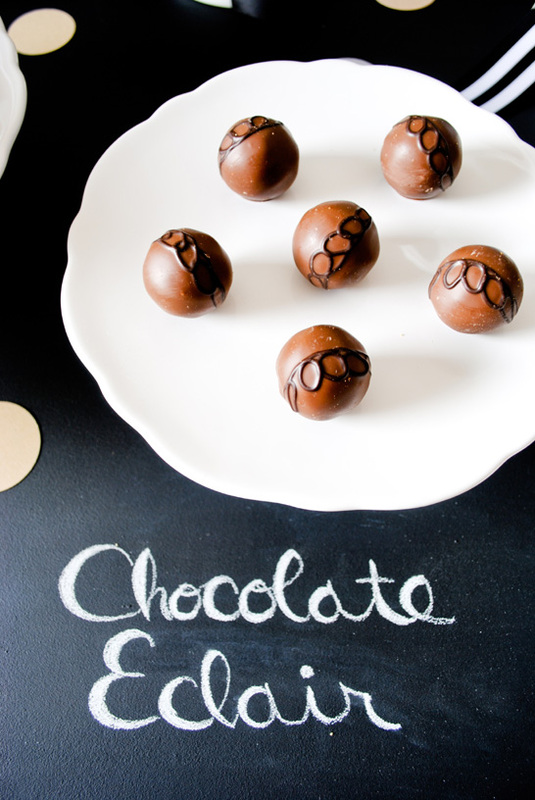 The chocolate truffles are the star of this show, so the baking and cooking prep is minimal. Which makes it easy on the hostess! 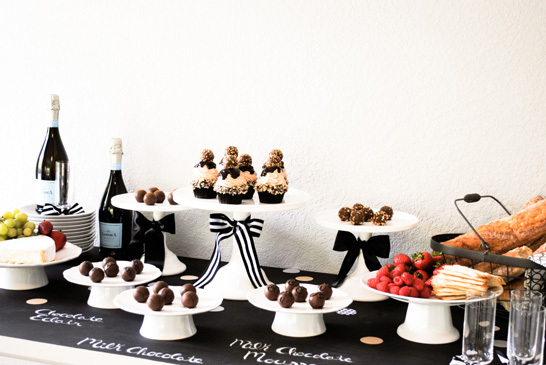 I think this would be an amazing birthday celebration, bridal shower or holiday party. Add a spooky theme for a grown up Halloween Bash or a touch of glam for New Years Eve. Whatever the occasion, it’s a delicious way to party. Plus the Truffle Flights are a perfect gift for the upcoming holiday season! I’m sure we all have a chocolate lover on our shopping list. Okay, I promised you a recipe. So let’s get to this cupcake!! It is packed full of Godiva Chocolate goodness. It starts with a classic chocolate cupcake which is then dipped in a dark chocolate ganache and rolled in roasted hazelnuts. Frosted with a milk chocolate swiss meringue buttercream and then drizzled with more dark chocolate ganache. 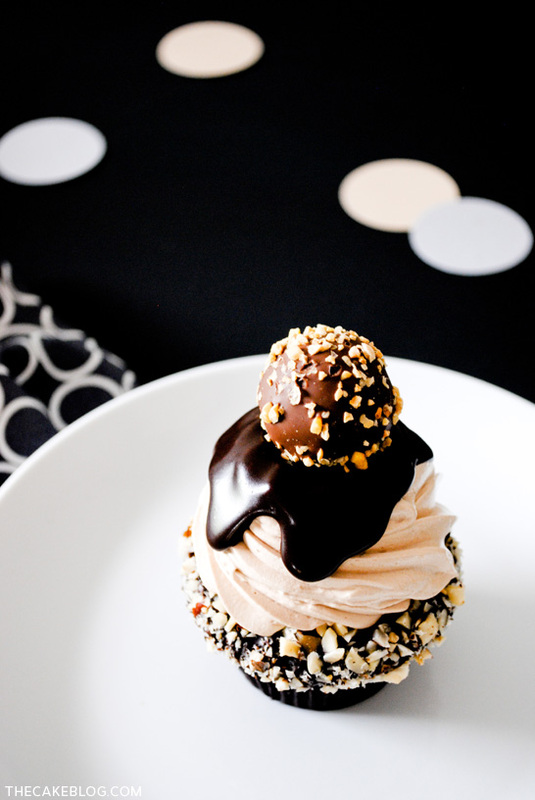 And perched on the very top of all this dreamy chocolate? The Hazelnut Crunch Truffle, of course. It is outrageous!! 1. Preheat oven to 350. Line cupcake tin with wrappers. 2. Sift together flour, cocoa, baking powder and salt. Set aside. 3. In the bowl of a stand mixer, beat butter and sugar on medium-high using the paddle attachment. Cream until pale and fluffy, about 5 minutes. 4. With the mixer on low, add eggs one at a time. Mixing well after each egg. Mix in vanilla extract. 5. Add one third of your dry ingredients and mix just until combined. 6. Add one half of your sour cream. Mix. Alternate ingredients again. Dry, wet, dry and mix gently. Do not over mix. 7. Divide batter into prepared cupcake tin. Bake 20-25 minutes. Cupcakes are ready when a toothpick inserted in center comes out clean. 1. In bowl of stand mixer combine egg whites, sugar and salt. Place over a pan of simmering water and whisk continuously until temperature reaches 160 on a candy thermometer and the sugar is dissolved, about 3 minutes. (The mixture should feel smooth when rubbed between your fingers). 2. Attach bowl to mixer fitted with the whisk attachment. Starting on low speed and gradually increasing to medium-high, whisk until stiff peaks form and mixture is fluffy and glossy, about 10 minutes. Your bowl should no longer feel warm to the touch. 3. With mixer on medium speed, add butter a few tablespoons at a time, mixing well after each addition. Continue mixing until icing is smooth and silky, about 10 – 15 minutes. 4. Add vanilla extract and chocolate. Mix until well combined. Disclosure: Compensated post by Godiva. Recipe and photography by Carrie Sellman for The Cake Blog. Thank you Chris! Tasted even better – YUM! This party is so lovely and elegant. Oh my goodness I just read the description of each truffle imagining I was at your tasting party savoring each mouthful. What a very beautiful presentation. This will be perfect table setting for bachelor party or birthday party. they look lovely and delish! I’m not sure if I’ve ever seen a cupcake that looked as decadent, chocolate-y, and crazy-good as yours right here! I’m a huge chocolate lover and I’m pretty sure this would satisfy every chocolate craving I’ve ever had!. And those Godiva Chocolate Flights? I need to get my hands on a box or two of those! I never knew such a thing existed! Love this! 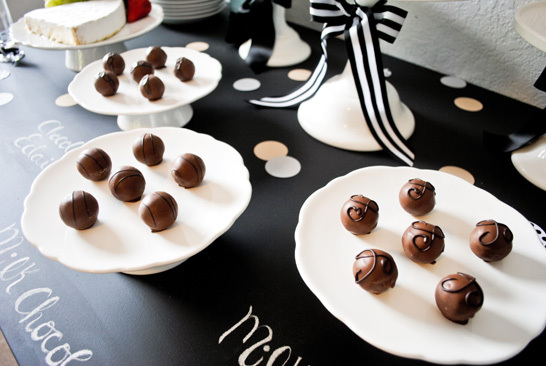 I got to throw a Godiva party too–so fun, right? That cupcake is calling my name in a MAJOR way. Chocolate and hazelnut? What’s not to love?! Looooooove your blog. I am a sydney based cake designer myself and found your web and info so interesting. Great start for my own blog. I would love to have blog have a following like yours. I am writing away and have just begun my own The Cake King blog. I also have facebook, twitter and pinterest. I would love to stay interactive with everyone. Thoughts are my own and am more than happy to give my own tips and tricks!!! Let’s all get networking guys and girls. Carrie, your cupcakes are really breathtaking, so decadent, pretty and so luscious. I’ve featured this recipe on my blog, hoping that you don’t mind, but if you do, please contact me and I’ll remove it. All the best. Such a great job Carrie! Love the chalkboard table! Thanks Rebekah! The chalkboard table is my new favorite thing… can’t wait to have an excuse to use it again! 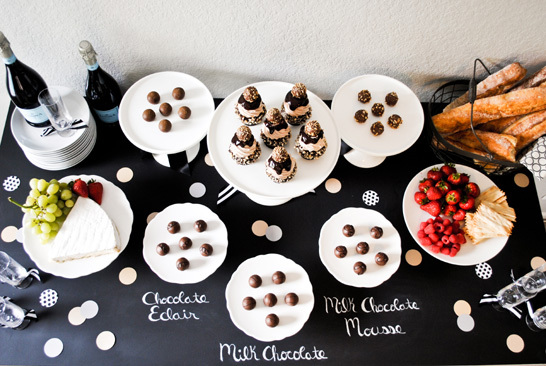 Whoa, a chocolate tasting party? That sounds like my kind of party! Everything looks amazing Carrie! My kind of party too Glory! Chocolate. Chocolate. And more Chocolate!! Thanks for your sweet feedback. Makes my day! Oh Carrie this is fabulous! 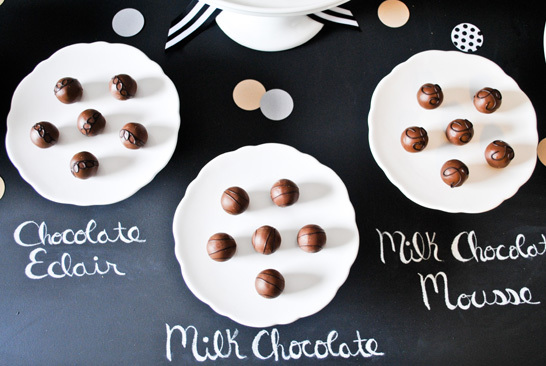 What a great GNO idea…you had me at chocolate! Wow! This made our day. Our year even. Delicious! OMG…I am dying! This LOOKS amazing and absolutely delicious!!! 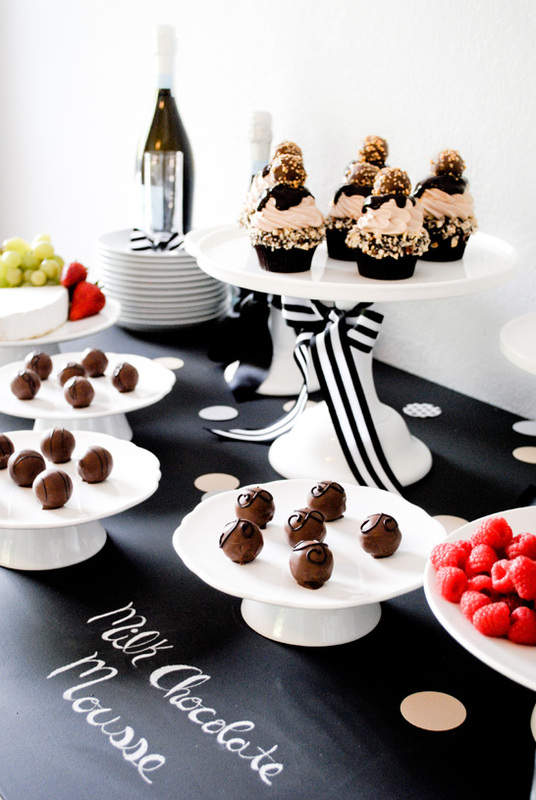 I love truffle and cupcakes and this look amazing. 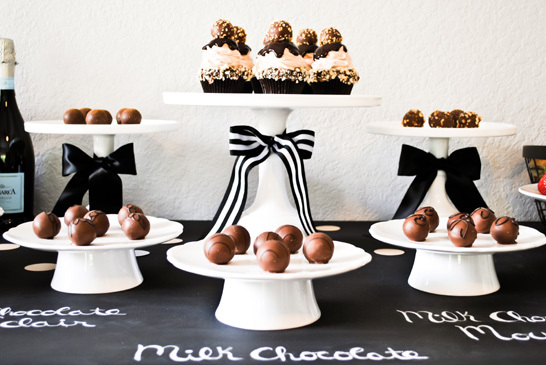 I’m making these for my sister in law’s baby shower and had a question.. Can I make these completely minus the truffle on top and store them in the fridge overnight? If so, what’s the best way to store them? Thank you for sharing this amazing recipe! Carrie first off, these cupcakes look amazing! I’m actually in the midst of making up my own batch as we speak. The frosting isn’t whipping up though, it has the consistency of the ganache and I don’t know what would have caused it or how to fix it. Any suggestions for future reference? Have you figured out how to fix the problem though? If yes please let me know how to fix it. Looks awesome! But the buttercream didnt turn out as good as yours, the egg whites didnt whip up. Ended up with a liquid mixture. Any idea why? If you already mixed them, put the whoe souply mess in the fridge while still in the bowl till it is slightly cold and then whip whip whip! it WILL come back. Oh and use the flat attatchment on your kitchenaids, not the whisk. Wow! I want to try each one of these – they look fabulous! 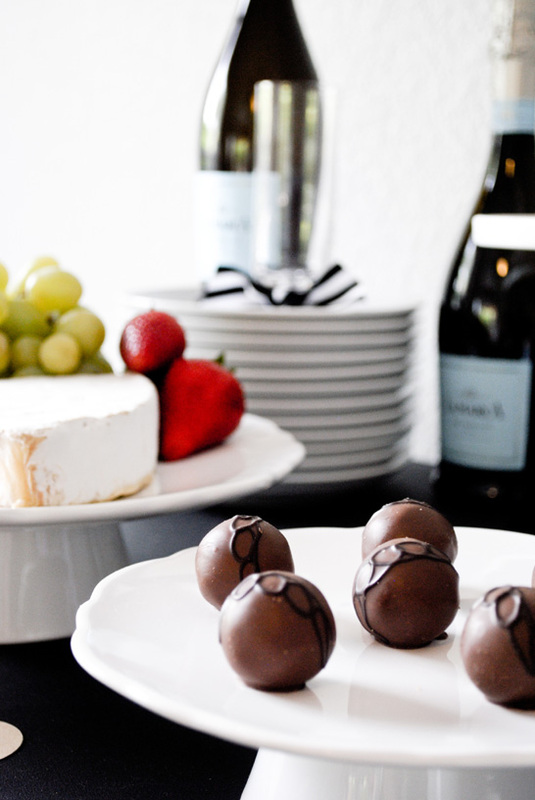 This would be a great girl’s night; because, what girl doesn’t like chocolate?! I can’t wait to do something like this with my girlfriends. Thanks for the tips and the recipe! I’m excited about trying the Godiva Hazelnut Crunch Cupcake. I shared this post with everyone for National Chocolate Day today on twitter and Facebook. I have the pieces all made and I just tried the cupcake by itself and its dry and chalky and very dense. I’ve never had an issue liked this before with a cake. Is it supposed to be the texture of a bad brownie?